The hippies of Ibiza have become a symbol of the white island. More than that, they are part of its history and culture. The hippy movement began in Ibiza in the 60s. Young people from all parts of Europe and North America were fleeing the situation in their countries after the Second World War. Discontent with the society and politics of their countries, they looked for quiet places, far from being overcrowded. These young people were children of wealthy families, scholars, and cults that sought a cosmopolitan and bohemian atmosphere. 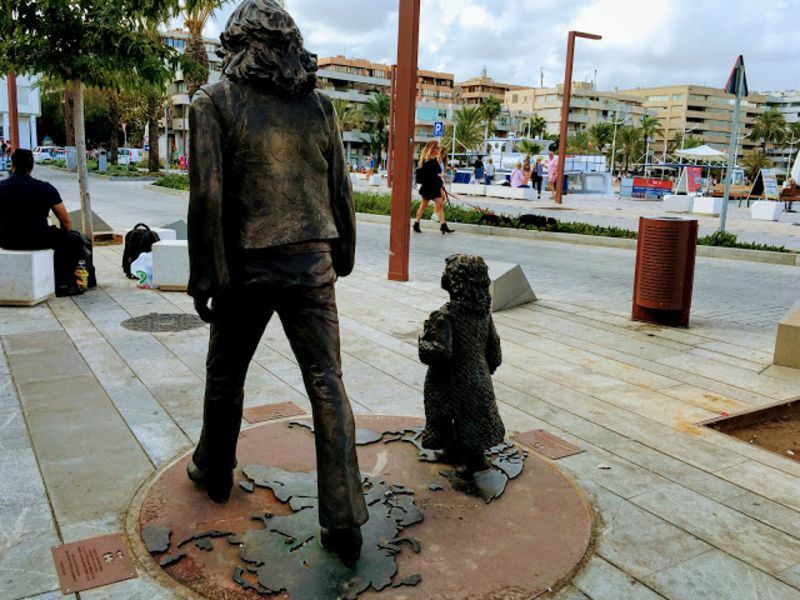 The sculpture is the work of Catalan sculptor Ció Abellí and consists of a three-dimensional representation of a famous image by photographer Toni Riera. 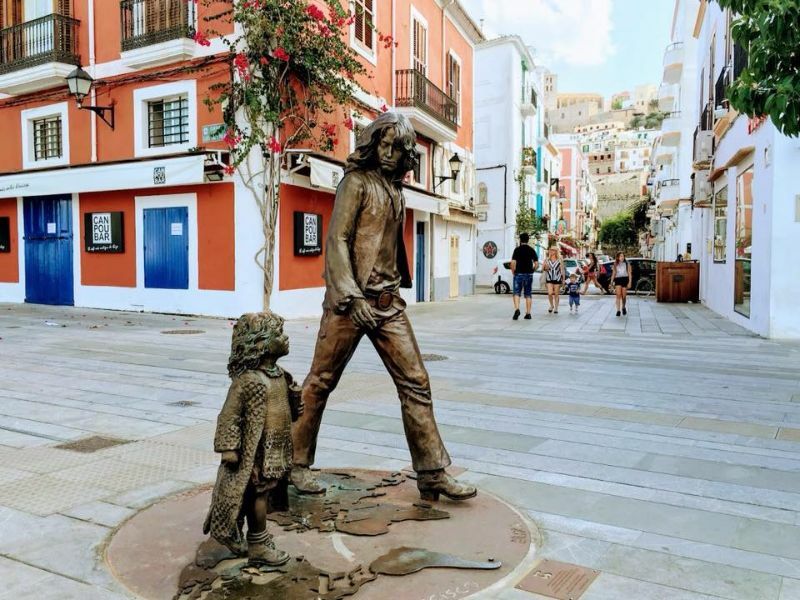 The monument shows, in full size, a man with long hair and hippie aesthetic, with a cigarette in his hand, while walking with his little daughter, who holds a bottle. 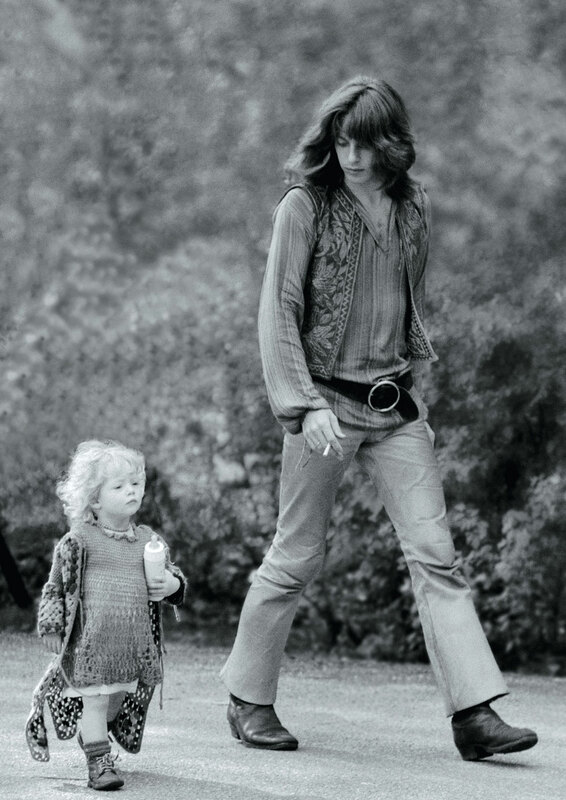 This photo -a hippie with his kid- was taken by Tony Riera in Vondelpark, Amsterdam in 1968. Despite the fact that the photograph was taken in a park in Amsterdam in 1968 it has served as an icon of the island on innumerable occasions. At their feet is a world map highlighting all the most significant international hippie concentrations: San Francisco, Amsterdam, Kathmandu, Goa and Ibiza. 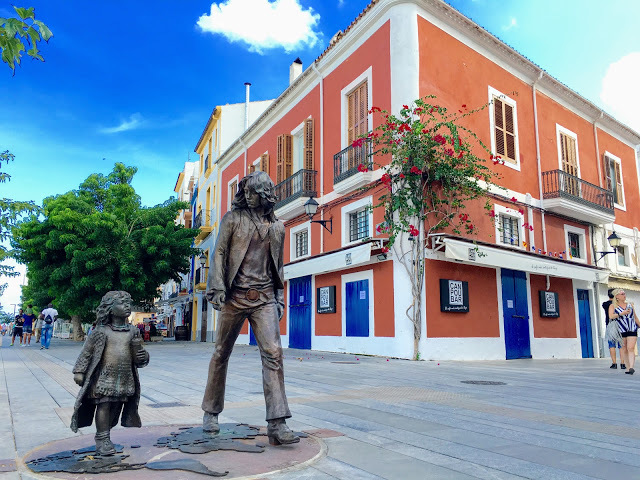 The work was donated to the town by the founder of the Pachá Group, Ricardo Urgell. The curious thing, however, is that it was not taken in Ibiza but in Amsterdam. Riera captured her while lying in a park in the Dutch city and never knew the identity of those who appeared in her. The mystery was solved a few years ago, when the girl, now an adult woman, went on a trip to Ibiza to the Pacha disco and found herself face to face with the image, recognizing herself immediately. Thus, we come to know that the protagonists are a former actor, Sandy van der Linden, and his daughter Radha. Despite being so recent, it is one of the most popular monuments on the island and there are always people taking photos with it.